The fish Manhanttan Fish Market best of the best! Swim by from 18 – 21 April and 25 – 27 April 2017 to enjoy The Best Deal in town!!! 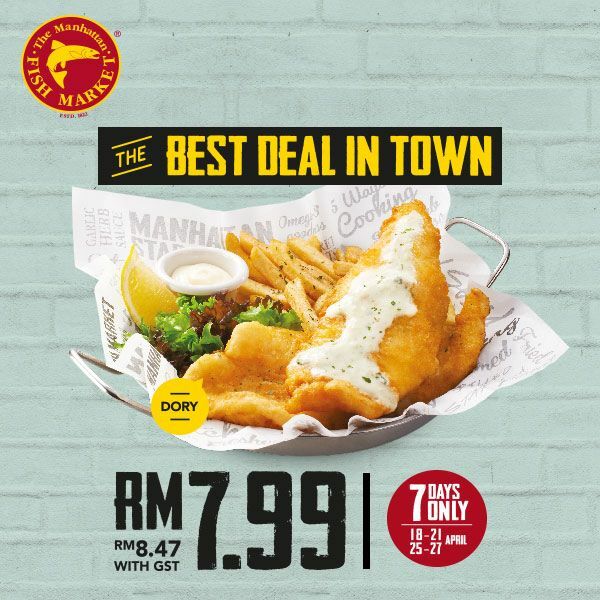 At only RM 7.99 (RM 8.47 with GST) you get to enjoy a plate of good ol’ Manhattan Fish ‘N Chip. This year, we have ried Squid Crown as the new additional to the family, 3 sea-lections of fish to choose from, and 2 cooking methods; fried or grilled. This is shore-ly a catch you must not miss... Don’t forget to complete your meal with add-ons. Visit in – store for further details of promotion. At The Manhattan Fish Market, our guest are treated and served by our friendly staff at our award winning casual restaurant to a smorgasbord of an all American- style seafood comprising lip-smacking dishes from the famous Manhattan Fish n’ Chips to the all-time favourite Garlic Herb Mussels and the grand delight of the Manhattan Flaming Seafood Platter to indulge all fans of seafood.